DisabilityTechDad: Fundraising - Part 1 - Is It Begging? For the last 12 months our have been fundraising for our son. When we started we were very uncomfortable and it definitely felt like begging! On reflection it still feels uncomfortable, but it feels great to see what our community has achieved and how my son Macsen is benefitting from it. Throughout we have been split between our pride and helping our son. This is the first part of a 3 part blog, which will cover our feelings towards fundraising, what we did and finally what we achieved. I must start with a recommendation for anyone who needs help to look into charities, councils and the NHS (here is a good list to start with: http://www.smartboxat.com/funding/). Each of these are setup to help families to fund specific items. This works for lots of families every year, but budgets are often tight so they cannot help everyone and decisions are often made using means testing with very low thresholds. Although this is understandable it unfortunately leaves a lot of families without essential financial support. We found ourselves in this situation. I'm not going to claim that we are poor or on the breadline. My wife and I both had well paid jobs before Macsen was born and like many other professionals in their twenties we bought a house at the top of our budget that was dependant on 2 salaries. As Macsen's conditions developed it became clear that my wife wouldn't be able to return to work. This left us in the position where our income was reduced by over a third. Our income is still considered good, but our little disposable income disappeared at the time we needed it most. We were in the position where we were identifying equipment and products that would help our son's development, but we quickly learnt that the special label comes with a large price tag. 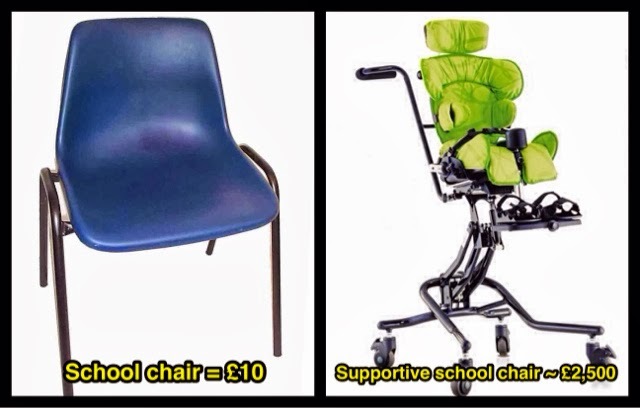 Here are some examples of comparable standard and special needs products, it's pretty obvious that essential items for someone with a disability are extremely expensive. 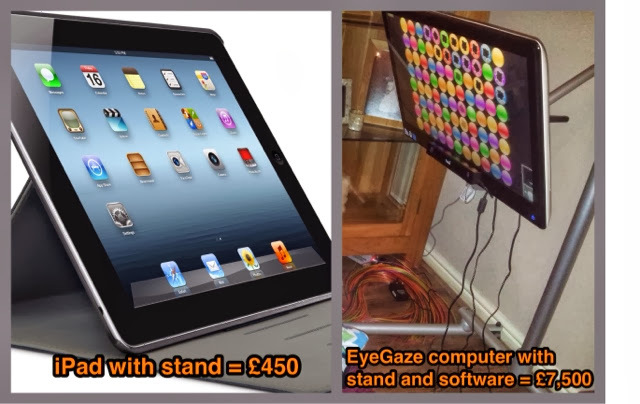 The first product that we knew we needed to get was a Tobii EyeGaze computer (please see my last blog for details). We knew we had to buy a system for Macsen, we had tightening budgets and we realised that we were not suitable for charitable grants. As professionals we never thought we would be in this position, but we reluctantly decided to fundraise ourselves. * Our amazing friends and family who had been looking for a way to help us. As soon as we announced (Facebook message) that we were fundraising we had donations and offers to help within minutes. Our friends and family have all said were grateful for an opportunity to help! * Companies want to help children like Macsen - most companies we approached offered prizes or donations instantly and were happy to help. They have money set aside to help charities and many allow their local stores/offices to donate to local causes. The message we kept hearing was that they were pleased to know exactly where their money was going. * People we didn't know who were looking for causes to help - as the message of our fundraising spread we were contacted by many people (friends of friends who we had never met) who were offering their time, money and support. Accepting all of this support was very difficult and overwhelming at times. On reflection it is clear that we made the right decision. Macsen has benefited from all of the things that the community bought and without them he wouldn't be where he is today and would not have the opportunities that are now ahead of him. If you are in the position we were in a year ago I urge you to consider fundraising. Please swallow your pride (I know it's easier said than done) and ask for help! My next blog will describe how we worked with a fundraising charity, what benefits this brought and the events were organised.